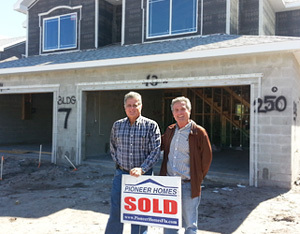 Pioneer Homes was founded in 1976 by George C. Zutes and G. P. Stamas. They approach development and homebuilding in a totally unique way - to sensitively complement the environment with homes and communities that preserve delicate natural beauty. As truly innovative developers and builders, these hometown residents are committed to responsible planning and growth that will make our communities a better place to live in the Tampa Bay area. Careful research, meticulous planning, attention to detail, and a strong customer service staff make Pioneer Homes the area leader in residential development and construction. Each home is designed to accentuate the beautiful tropical environment. By functioning as both site developer and homebuilder, Pioneer controls every aspect of their communities. The result is coherence and harmony that merits the serious attention of homebuyers who demand the very finest surroundings. With devotion to customer satisfaction, Pioneer provides custom design services to meet any special preferences or needs that the customer may have. In-house architectural and design services are provided as soon as a commitment to purchase is made. Property management and general real estate services by professional consultants are also available as part of the Pioneer Homes service team. This hometown company was founded on a dedication to genuine value and customer satisfaction. Each client is truly valued, not only during the initial sale and construction of the home, but afterward and for years to come. Pioneer is readily available to meet the needs of its homebuyers. A solid warranty program assures excellent service and prompt follow-up whenever necessary. Referrals and repeat customers have been a major source of business to Pioneer Homes. References from homeowners are the company's best advertising. Customers are treated with the utmost respect, service and personal attention. In addition, corporate financial stability has been consistent and secure throughout their years of successful operation. Zutes and Stamas, as permanent residents and successful businessmen, are committed to making their communities a tribute to personal integrity and responsible growth. The result is a higher standard of living for the entire town and a great investment for newcomers who demand the very best of Florida living.